The Siculi (Sikeli or Sicels) were a group of Italics who, during the Iron Age, gave their name to the island of Sicily. They were located on the eastern side of the island, in the interior, neighboured to the west by the Sicani, while surrounding them along the coastline were the many colonies of Graecia Magna, including the most powerful of them, Syracuse. The Oscan-Umbrian group of which the Siculi were part are largely accepted as being Indo-Europeans (perhaps proto-Celts) who migrated into the peninsula from the north, perhaps from as early as the eleventh century BC for this tribe. Given their later domains in the far south of Italy, the Siculi were probably one of the earliest groups to arrive in the peninsula. Several ancient writers attest to the Siculi being driven southwards by successive arrivals of other peoples, so it seems likely that they originally occupied a much wider swathe of territory, possibly the entire central section of Italy east and west of the Apennines. Pliny mentions a mixed group of Siculi and Liburni who were expelled from the Adriatic coast by the arrival of the Umbri. 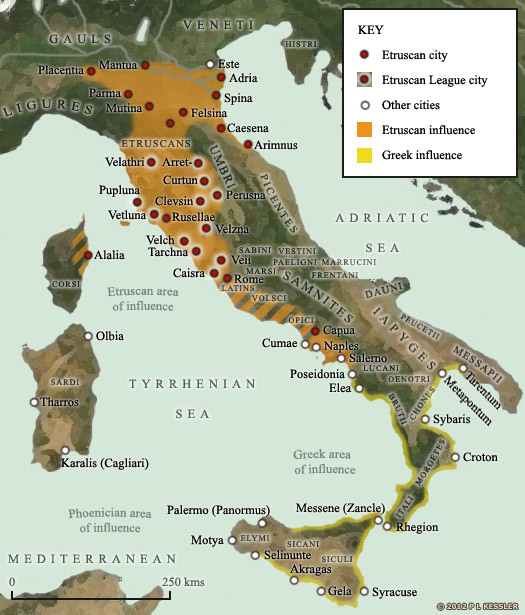 This may have occurred as the Umbri themselves were being ejected from their western territories by the Etruscans, around the seventh century BC. However, the later ejection of the Siculi from northern Calabria forces this prior event backwards, possibly as early as the eleventh century BC. Their language is largely unknown, but it may have been related to the Oscan-Umbrian group of Indo-European languages (P-Italic), which were widely spoken in Iron Age Italy before the rise to dominance of Latin (Latin itself was a slightly more distantly related language, coming from the Indo-European Latino-Faliscan group, or Q-Italic). The language of the Siculi influenced the Greeks on Sicily, and from there fed back into Greece itself and then into Latin. Similarities suggest that Siculi and Latin were related languages, since the former contained both words and grammatical forms which belonged to Latin but which were not common to either it or Greek. The Siculi left no inscriptions or other materials which would allow scholars to classify their language group. Ancient writers persisted in ascribing them with a Grecian origin, which was mixed fairly equally with the native barbarians amongst whom they settled when they arrived in Italy. A possible Grecian origin could make them cousins of the Illyrian tribes in south-eastern Italy, principally the Iapyges. The Sicani on the island are known to have had links to the Mycenaeans, but this would have been a good century or two before the Siculi can have arrived there. Seemingly before they arrived on the island, the Siculi could also have been linked to the Sea Peoples who devastated late thirteenth century civilisations at the eastern end of the Mediterranean. More specifically, a particular group of Sea Peoples known as the Shekelesh have sometimes been equated with the Siculi. The alternative form of the name, Sicel, could be another way of spelling Shekel, and the '-esh' could be a plural suffix that may have been of Egyptian origin. The name is pronounced in the Celtic manner, with an 'sh' and a hard 'k', suggesting that they were indeed Italics. Legendary king of the Itali or Siculi and successor to Morges. In his work, Politics, Aristotle names a king of Oenetria called Italus. Oenetria at this time is taken to refer to the 'toe' of the Italian 'boot', an area which is known today as Calabria. Aristotle claims that the Oenotri of this region had changed their name to the Itali. It is this name that is used by later Greek settlers to refer to the entire land, but this origin story is probably sheer invention. Thucydides claims that Italus is a king of the Siculi, while after diligent research Dionysius concludes that the Itali and Siculi are one people. At one time the Siculi are so widespread throughout Italy that it is termed the 'country of the Siculi', an inscription that is engraved in 'ancient characters' on a tripod in the temple of Jupiter at Dodona. King Morges of the Morgetes is claimed as the successor to Italus, and Siculus the successor to Morges, which seems to illustrate the belief that the Itali, Morgetes, Oenotri, and Siculi have a shared heritage. Pliny mentions a mixed group of Siculi and Liburni who are expelled from the Adriatic coast by the arrival of the Umbri, while the Picentes may also be part of this process. This may occur as the Umbri themselves are being ejected from their western territories by the Etruscans, around the seventh century BC, but the later ejection of the Siculi from northern Calabria forces this event back, possibly as early as the eleventh century BC. Pliny himself believes that the pastoral and agricultural Siculi are the original inhabitants of the southern and eastern sections of Umbri territory. Other writers such as Dionysius adds that the Siculi are the original inhabitants of the country in which Rome is later built. Cato says that the Siculi, who are unused to warfare at this stage, are driven out following a long series of wars against what he calls 'aborigines'. Dionysius identifies these as the Latins. While having inhabited much of central Italy from coast to coast, the Siculi have already been driven out of the western side by the Latins, and out of the eastern side by the Picentes and Umbri. This constant process of the Siculi being driven out of central Italian territories and pushed southwards would seem to confirm the idea that they had originally arrived from the north. Heading south, the Siculi would not have been able to penetrate into the territory of the Illyrian Iapygres in the south-east. Instead, they seem to occupy the modern region of Basilicata, but only briefly. According to Thucydides, the arrival of the more warlike Oenotri and Opici in northern Calabria triggers the migration of the Elymi, Itali, and Siculi into the 'toe' of Italy and onto Sicily. Antiochus of Syracuse, writing around 420 BC, confirms this. The writers seem to consider the Siculi to be more barbarous than the Opici. Once on the island, the Siculi push the Sicani to the north and west, and form the dominant tribal power. Elements of the Siculi seem to remain on the mainland for many centuries to come. 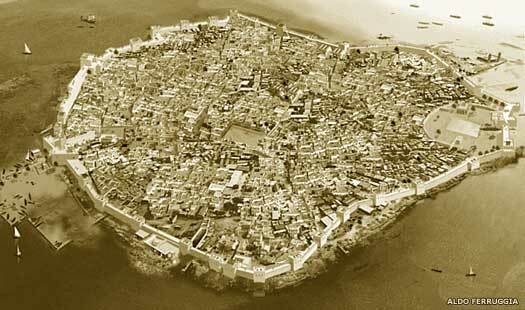 Greeks from Corinth found the colony of Syracuse on the south-eastern corner of Sicily. While the main body of Siculi are forced inland by the newcomers, many of them are subjugated and used as the colony's main labour and agricultural force. With the larger part of the colony's population consisting of native Siculi, their language eventually influences the Greeks, appearing in compositions that represent this new dialect, such as the comedies of Epicharmus and the mimes of Sophron. The recent termination of the tyranny of Gelon I and his brothers in Syracuse has left problems in its wake on Sicily. In 460 BC, war breaks out between Syracuse and its former colony at Catana. Ducetius, a prominent Hellenised Sicel, backs Syracuse in revenge for the former occupation of Siculi land by Catana, and the latter colony is defeated. Ducetius goes on to found the city of Menai (modern Mineo) and occupies Morgantina. By 452 BC he has united central Sicily and has also founded the city of Palice, which becomes his capital. Sicel leader who instigated a revolt against colonising Greeks. Palice quickly becomes a place of refuge for runaway slaves, and its population swells. Ducetius conquers Aetna, which lies to the south-west of Mount Etna, before also occupying Akragas (later Agrigentum, modern Agrigento). Syracuse becomes concerned by this seemingly unstoppable expansion by the Sicel leader. Ducetius takes Motya (the modern island of San Pantaleo), a stronghold which had formerly been held by Akragas, so in 451 BC Syracuse assists Akragas in opposing him, unsuccessfully. The power of Ducetius and his Siculi empire is now at its height. Ducetius suffers a shock defeat when his forces are decisively defeated at Nomae. His surviving army is scattered amongst the Siculi cities, and Ducetius remains with just a handful of followers. Akragas reclaims Motya and Ducetius flees to Syracuse, where he is tried by a general assembly and exiled to Corinth for life. Ducetius returns to Sicily, according to Diodorus, where he founds the city of Kale Akte or Caleacte on the northern coast (modern Caronia). Diodorus also contradicts himself by stating that Ducetius colonises Kale Akte in 440 BC. Archaeology has shown the existence of a Sicel settlement at this location in the early fifth century BC, and the return of Ducetius is probably with the permission of Syracuse, in the hope of establishing a permanent peaceful alliance. Unfortunately, Ducetius dies following an illness in 440 BC, and is unable to influence the subsequent revolt of the Siculi against Syracuse. The revolt quickly falls apart, the city of Palice is sacked, and its Sicel inhabitants are sold into slavery. Antiochus of Syracuse completes his History of Sicily and Colonising of Italy around this time. The works exist today only in fragments but they are highly regarded by the ancient world thanks to the accuracy of their information. Antiochus writes that the Siculi who still exist in the northern and interior areas of Sicily are recognised as being Oenotri. Whether this means that they are a division of the Oenotri tribe or that they originate from the region of Oenotria (modern Calabria) is unclear, but the latter is true anyway. Writing at this time, the reliable Greek historian Thucydides of Alimos (close to Athens), mentions the Siculi. He says that groups of Siculi still occupy the Italian mainland in his time. It is possible, given their close links in the past with the Itali, that this people could be Siculi in all but name. The Marsi fight the Social War against Rome in which Rome's allies strive for, and are eventually granted, citizenship. The Frentani, Latins and Umbri are also granted citizenship, although they play a smaller role in the war, with the Umbri joining the rebels late and agreeing terms with Rome early on. Thereafter, the Siculi are gradually absorbed within Roman Italy and lose their individual identity.